I agree with James that this is his best novel and, for me, his most pleasurable. For the reader who enjoys immersing himself in a quiet world of nuance and the half- and mis-understood actions and motivations that make of us constant mysteries to one another, here's the perfect venue. And make no mistake—beneath the quiet surface run currents of rage, humor, and passion, heartbreak and pathos. Here's a book entertaining and of fabulous depths. 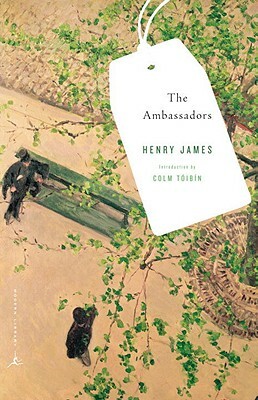 One of the final masterpieces from one of the world’s greatest authors, Henry James’s The Ambassadors is now available for the first time in a Modern Library edition, with a new Introduction by acclaimed novelist Colm Tóibín. A keenly observed tale of a man’s awakening to life, this dark comic novel follows Lewis Lambert Strether, a middle-aged widower, on a mission to Europe to convince his fiancée’s wayward son to forsake the pleasures of Paris and return to America. Rich with fin de siècle detail, The Ambassadors brims with finely drawn character portraits, including one of the Master’s most unforgettable heroines—the beguiling Madame de Vionnet. This was the novel that Henry James himself considered his finest, and no one is better equipped to put it into literary and historical context than Colm Tóibín, whose award-winning novel The Master depicted the inner life of James in the final years of the nineteenth century. Colm Tóibín was born in Ireland in 1955. He is the author of six novels including The Blackwater Lightship; The Master, winner of a Los Angeles Times Book Prize; and Brooklyn, winner of a Costa Book Award. Twice short-listed for the Man Booker Prize, Colm Tóibín is the Leonard Milberg Lecturer in Irish Studies at Princeton University and lives in Dublin and New York.